Equine Facilitated Therapy Programs need special equipment. The ramp, hitchrail and wash rack enable people in wheelchairs to groom, wash and have hands-on contact with the horses. They are able to assist with harnessing and hitching the horses to a carriage. 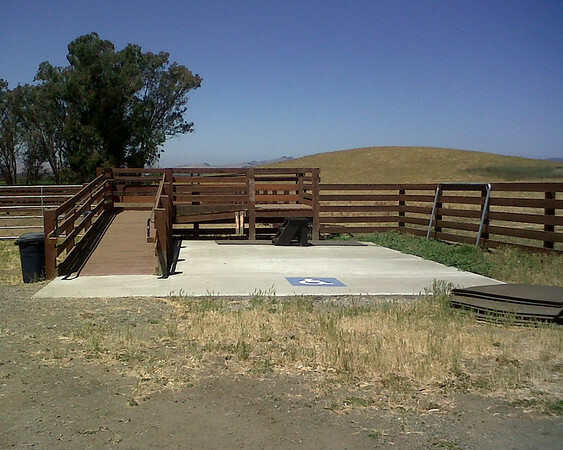 With this unique structure wheelchair users drive up the ramp and can be assisted onto the horses for Therapeutic Riding. The project was designed and built by Access Adventure volunteers. Pam Seifert, an architect, designed the structure, husband, Steve Harvey, engineered and directed its completion. A grant from Bay Area Barns and Trails Trust provided the materials such as wood, hitch rail, mats and supplies. Their contribution was augmented by private donations and foundations, including concrete provided by the Syar Foundation.